Keyboard shortcuts is usually much speedier than reaching out your mouse, moving it, pointing it to something and clicking. But there are some things which cannot be done that easily by keyboard shortcuts. For me, one of them is finding out a closed project and open it. Unfortunately, I've quite a large set of projects in my workspace and try to keep most them closed, when not used. 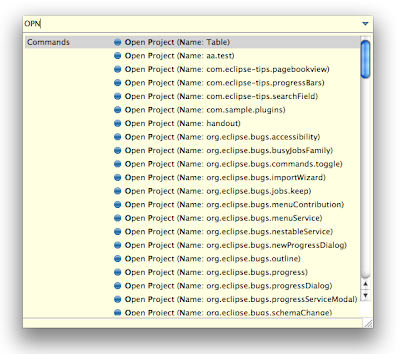 In addition to that in the Package Explorer, I've the 'Closed Projects' filter on. So if I need to open a project, I've use the pull down menu, uncheck 'Closed Projects' navigate thru the working sets to find the right project and double click it. To enable keyboard access to this regular task, I decided to make use of Commands Framework.